Lying just 6 km off the coast of northern Malta, Gozo is often assumed to be a smaller version of its sister island. 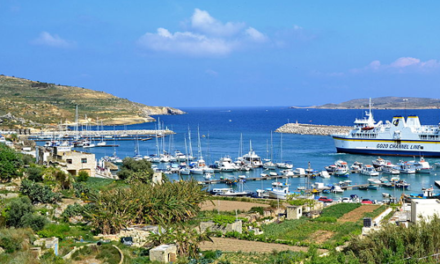 In some ways it is: the neat fields sheltered by stone walls, the flat-roofed houses and the dazzling blue waters surrounding the island are all reminiscent of Malta. At the same time it is noticeably more peaceful and rural, the pace of life is slower, the land is greener, the streets are cleaner and the coast is quieter. Looking over the wide valley and sweeping sands of Ir-Ramla (Ramla Bay), it is easy to see why the Gozitans (among other contenders) have always claimed theirs as the fabled Island of Calypso where the sea-nymph held the Greek hero, Odysseus, captive for seven years. Getting around Gozo presents no difficulty. All roads radiate from the capital, Victoria, and the signposting is good. Most visitors come for the day from Malta, taking in Victoria, whose handsome citadel sits on a hill at the island’s center, the finely preserved prehistoric temples of Ggantija and the fishing villages of Xlendi or Marsalform. Those who give the island more time or choose to stay here and explore its coastline and landscape will discover there is far more to the island than these well-known spots. The capital and the hub of the island, Victoria combines an impressive hilltop citadel and a lively town below. The name was given to the city in 1897, on the occasion of Queen Vicoria’s Jubilee; but to the Gozitans – and many Maltese – it will always be Rabat; that name means suburb and, as with Mdina and Rabat on Malta, the town here is a suburb of the fortress. Victoria is a place to visit rather than to stay. One guesthouse is the only accommodation and there are very few places to eat at night. Cliffs, caves and freaks of nature combine to make Dwejra’s seascape the most spectacular in Gozo. In calm weather the deep, clear and intensely blue waters are excellent for diving, snorkeling and swimming. Here, too, you can see the oldest salt pans on Gozo, from which sea salt is still collected during the summer. Thousands of years of erosion by the sea have created this monumental limestone archway at Dwejra Point. The long ledge of rock forming the upper arch of the ‘window’ is in danger of collapsing – not that this deters geologists and others from walking across it to scan the rocky ledge for fossilized sea creatures. The plant that once thrived on this steep-sided offshore rock was prized by the Knights for its medicinal properties – so much so that they jealously guarded the islet and made it inaccessible. The only way of reaching the virtually unscalable rock was by means of a hoist from the still-standing Qawra tower to the top of the rock. Any unauthorized person found attempting to gain access was sentenced to death. The plant was pulverized by mortar and pestle, mixed with a little wine and syrup and taken as a cure for dysentery and hemorrhages. Arriving in Gozo from Malta, your first close-up view will be of Mgarr, where fishing boats and ferries lie in a harbour backed by flat-roofed houses on the hillside. Dominating the scene are the churches of Our Lady of Lourdes, on the craggy cliffs above the village, and a neighboring Ghajnsielmen. Modern development continues apace, and the fishing village has a new 4-star hotel, as well as the 5-star L’Imgarr which sits conspicuously on the cliffs. To the southwest lie the walls and bastions of Fort Chambray. North of Nadur, Ramla Bay has a splendid stretch of ochre sands, its green blue waters protected by a rugged headland. Given the ease of access and the fact that it is the only sandy beach of any size on Gozo, it is not surprising that the bay draws Gozitians and foreigners in large numbers during the summer months. Beach facilities include cafés, water sports and sunshades. Even so, care must be taken if you intend to do more than sunbathe: a notice beach on the beach warns swimmers of dangerous currents and reefs. In the nearby Ramla Valley, the terraced fields, divided by bamboo fences, create a patchwork effect and lend an impressive backdrop to the bay. This is claimed by the Gozitians as the abode of Calypso, the sea nymph who enchanted Odysseus on his journey home from the Trojan War. The cave has since become blocked by boulders and now amounts to no more than a crevice on the cliff. In the Odyssey Homer describes Calypso’s Cave as being surrounded by poplar and cypress trees, with a grape-laden vine at the opening. The best thing about the cave today is the breathtaking view over Ramla Valley and bay. The deep Xlendi valley runs down to one of the pettiest creeks on the island. The idyllic landlocked bay and the glorious blue-green waters were for many years a haunt of artists and photographers. More recently it has become very much a tourist resort, and the village has expanded to take in apartment blocks, holiday villas, souvenir shops and even a 4-star hotel. It is enormously popular and consequently in summer gets very crowded. Out of the holiday season it still managed to exude local character and undeniable charm. The shingle beach, rocky shore and clear waters are good for swimming and the caves and rugged reefs provide ideal conditions for snorkeling and scuba diving. On the cliff-side a series of steps, with beautiful bay views, lead to a small secluded pool which was once so private and little known that the local nuns used to come here and bathe. Xlendi looks its best in the early morning or at dusk when the day-trippers have gone. Ideally you should stay for an evening meal for Xlendi is liberally endowed with a good eating places and the sunsets over the cliffs can be spectacular. Lying between Malta and Gozo, Comino is the smallest inhabited island of the Maltese archipelago. There are no cars, no high-rise buildings, no hunters – just a couple of hotels, a tiny hamlet, a chapel, a disused cemetery, a police station, a piggery and a small chapel where Mass is celebrated once a week. The only vehicles on the island are the Comino Hotel’s Range Rover and a truck for transporting goods. Comino has three little sandy beaches and is surrounded by glorious ultramarine waters and its caves and creeks are ideal for swimming, snorkeling and diving. The iridescent waters of the Blue Lagoon, between Comino and the rocky islet of Cominotto, are irresistible – especially if you get here early in the day, before the cruisers and yachts arrive from Malta. The seabed here is covered with white sand which reflects the sunlight so that the waters take on a glorious turquoise hue.